From September 14th to September 30th, 2018, Kaikai Kiki Gallery is pleased to present Mouten—blind spot—, a solo exhibition by TENGAone. Born in 1977, TENGAone’s creative trajectory originates from his longstanding career as a street artist in Tokyo, where he has established himself as a key member of the local graffiti movement. 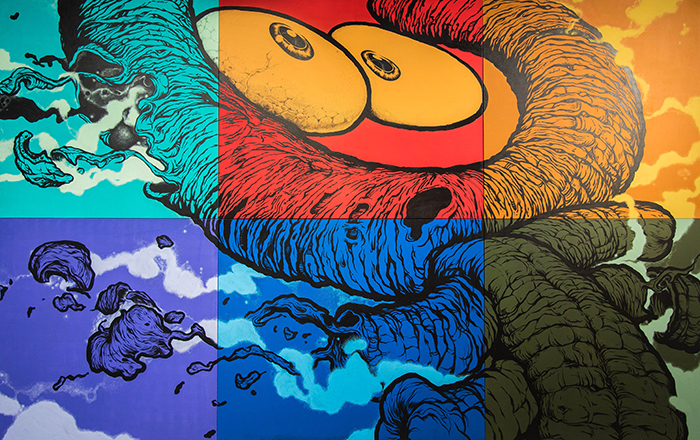 Initially recognized for his iconic and highly stylized monster-esque characters, TENGAone’s immense technical skill coupled with his affinity for constant experimentation has given him a diverse portfolio, ranging from large-scale wall murals and collaborative street pieces to sculptures, drawings, paintings, and even apparel. He has exhibited in several group and solo exhibitions, as well as participated in international showcases and art fairs such as Disney’s BLOC28, Beyond the Streets L.A., Art Fair Tokyo, and Frieze New York. The inception of his acclaimed “Fabrication” series in 2017 has further solidified his presence as an important emerging artist. Mouten—blind spot— will feature the artist’s latest body of work, including several new canvas works and a reimagined vision of the artist’s signature fabricated cardboard and concrete series. Throughout the exhibition, TENGAone eludes the simplified categorizations of street and fine art by employing distinct graffiti techniques and references, including tags, stickers and going-over. A manifestation of his street artist identity, TENGAone’s artistic approach also functions as a commentary on how we assign different values to art inside and outside the territory of an art gallery. The works explore the artist’s discontent with a society that only takes things at face value: the intricate MDF wood carvings of ripped cardboard, torn pizza boxes and other disposable materials, covered with fading images of universally-loved cartoon characters and child-like doodles, compel us to reconsider our thoughtless consumption of physical materials and images that are widespread and readily available. Motivated by his growing frustration as a street artist, TENGAone utilizes the gallery platform this time as a way to critique a society that values appearance over substance. We hope you will come witness TENGAone’s works in a new light at his first ever solo exhibition at Kaikai Kiki Gallery. The main artworks for this exhibition are the cardboard pieces. On these cardboard pieces, I painted cartoon characters. But you might notice something unusual about them. You may approach closer to inspect the details. I am, at my roots, a graffiti artist. You might associate graffiti with a pop and stylish piece of work. Yet, as it assimilates into the clutter of the streets, it becomes invisible to those who are uninterested. They are looking, but they aren’t seeing. This is why I decided to create cardboard, the world’s most ubiquitous packaging material, entirely from scratch. By painting familiar cartoon characters on this material, the purpose of the cardboard becomes obscure. It is the exact phenomenon that occurs with graffiti you see on the streets. If you do not look through an objective lens, you will become blind to the essence of what you are looking at. I want people to dispel their preconceptions and feel anew about what is mundane.